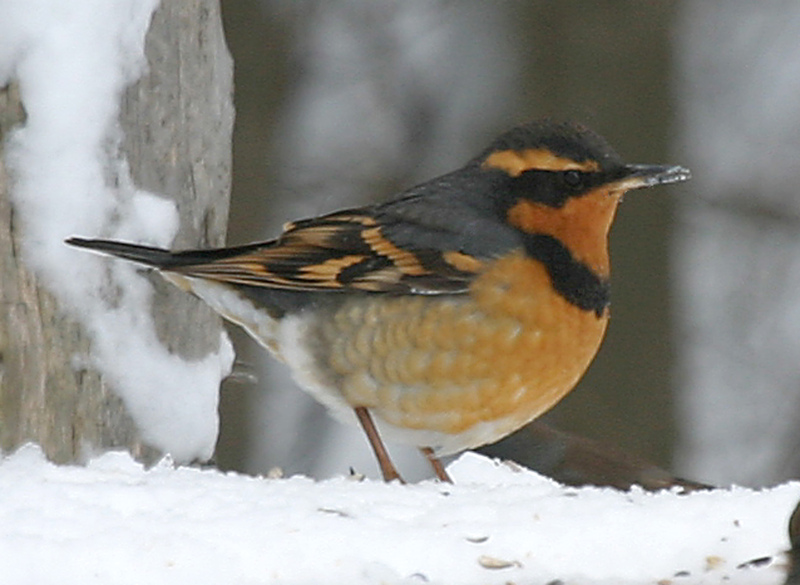 This male Varied Thrush at Long Pond, CBS provided the fourth record for Newfoundland. Origins: Breeds in the Pacific northwest from northern California to Alaska, wintering from southern British Columbia to southern California. Though rare east of the rockies, it has been recorded across the continent, often in winter. Record Details: Seven records for Newfoundland – all in winter: (1) Bristol’s Hope, March 4-25, 1998; (2) Pouch Cove, February 7 – March 29, 2000; (3) Long Pond CBS, February 6 2002; (4) Long Pond CBS January 28 – March 8 2005; (5) Renews, January 29 – February 12, 2006; (6) Rocky Harbour, February 2 – March 5, 2016; and (7) Renews, January 23, 2017 (captured only on a trail camera at a local feeder and never seen again).